Many seniors request photos at the beach. Some of them want to use Presque Isle beaches, which feature wooded backdrops and sandy beaches. Others ask to visit some of the beaches on the East side of Erie County, such as Shade’s Beach in Harborcreek or Freeport Beach in North East. This image of Joe was taken in North East at Shade’s Beach. On a warm but overcast afternoon, we hit this rocky beach for some individual and family images. The uniform cloud cover made for very even lighting. Among other things, Joe is a musician and drum major in the Iroquois High School Marching Band. 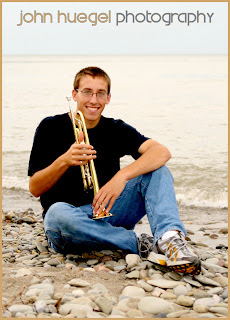 Here we featured Joe with his trumpet against a backdrop of Lake Erie. A little bit of contrast enhancement with the Curves and Levels tool brought out the color of the clothing, the shine of the trumpet, and the transition from water to sky behind Joe. Today we had a great shooting adventure in the north and east of our fair city. Starting at Behrend Fields for some woods and soccer shots, we moved then to the North East campus of Mercyhurst. 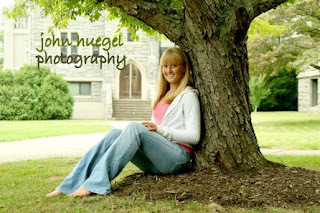 Here is a shot of Danielle near a tree she really wanted to climb. We finished the outdoor portion at Freeport Beach where we took in a wonderful sunset and messed around with some neat action shots. Then we captured some really interesting indoor shots. Danielle, great images. Thanks for being so creative!